get it as a text so you may customize design with your own HTML/CSS. With this plugin you will not need any more third party buttons or scripts as it connects directly to FeedBurner, Facebook and twitter. This plugin should speed up your blog as counters are cached in your database and are refreshed no more than once per 2 hours. 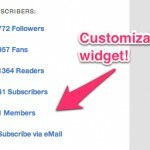 With third party buttons every page load gets all counter data from external websites that slow down you blog. Happy with "Subscribers Text Counter"? Plugin is hosted on WordPress plugins directory. You can download it from here. I would like to make a special thanks to Antti Kokkonen aka Zemalf for making a blog post that have inspired me to write this plugin. Some code (most viral for this plugin) is based on his post. Subscribers Text Counter is under GPL license from the Free Software Foundation. The code is provided «as-is» and in no event shall the copyright owner or contributors be liable for any direct, indirect, incidental, special, exemplary, or consequential damages. 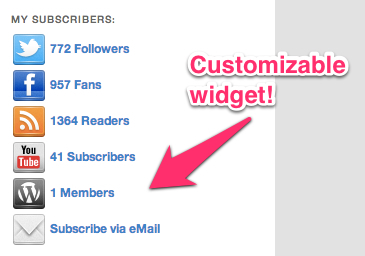 Thanks for the shout-out/credit :) Widget looks great, so I’ll give the plugin a test-run for sure. I’d add option to adjust the update interval (10 minutes is an overkill, as even every other hour is plenty). 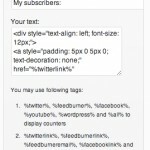 Instructions on how to add the numbers anywhere in the theme-files would be cool too, not just widget (as it’s cached it can be used on after-post call to action, etc.). Thanks for your suggestions. I will try to include it in a future releases. And thank you again for your post as it inspired me to make this plugin. It is a well done job. Thanks a lot for thinking about it, i am testing it for sure on my blog. Can the plugin be called outside the widget with ? I’m looking to call this outside of the widgets as well… help please!! Will be possible in next release (in development – you have to wait few days). At the moment I am running wordpress 2.9.1 and it isn’t showing twitter or feedburner stats (and my awareness api is active). UPDATE: As I told before – warning is caused by your server limitations. Additionally this plugin requires PHP in version 5 or higher (won’t work with PHP 4.X). Waiting for that too! Thanks! Ah I see. Well because I know I’m running PHP 5 and have never knowingly disabled any functions in my server configuration i looked into on my host’s community forum. Apparently allow_url_open is turned off by default for security reasons. The quick solution would be to enable it using a custom php.ini, but later read that it’s much safer to use cURL instead. I’m not getting any error anymore and your feed shows up now, but the twitter and rss count still show 0. Any ideas? New version will be available later today. You should check if it would work for you. I’m looking forward being able to get the counters from PHP code from any place of a certain wordpress template. Is that possible? Will be possible in next version. Working on it now. Hey KreCi, new version works great. Looking forward to seeing a user count added. Bravo! Good to see the combine all feature added, but it doesn’t seem to work when using in the widget? It just shows the text %all% instead of the actual count. Please update and check it now – should be working ok.
Hey Check it out Chris! Feel free to implement it if you like. Thanks! Will be applied in next release. I’ve updated to the latest version today but still, after an hour or so, the Twitter counter is empty. It worked at first after the upgrade. I have to go in an just enter static text. This necessitates that I do the same for the ‘all’ counter since it is based in part on the number Twitter shows. Any idea if this is fixable? Please try to reset all settings in your WordPress admin panel at “Settings/Subscribers Text Counter”, configure plugin again and refresh counters (on same page). I believe it is twitter API problem (not plugin related as it works on a few sites of mine and hundreds of others). I just installed 1.5.3, activated the plugin, and then wordpress loaded a blank screen. When I uninstall the plugin I get access back to the wp admin. Is the plugin data corrupted? If it is how do I start fresh with new data? Please try with 1.5.4 that will be released today. To create ‘all’ counter you need to reset counter on subscribers text counter settings page. I will release 1.5.4 today that would fix this error. I have a strange problem with the plugin. When I just installed it I set the wrong but existing twitter name in it. It worked ok. Some time later I tried to change the twitter name and set another one. And the widget still shows the old one. Then I tried to reset settings. All the info in the admin panel of the plugin has gone, the widget came to default look but it still keeps the old links although the fields with the names in admin panel are blank. What can cause such a problem? May someone has any ideas how to change the twitter profile in such situation? You need to put a new twitter nickname in the setting and the refresh counters. Any way to add YouTube subscribers? Sorry – not in my plans. Would you happen to know of a way to manually add a set number to the totals? This is a great plugin ! But, somestimes Twitter counter do not display the number of followers. Hi, Thanks for the plugins! Perfect! This is exactly what I have been looking for. Hi, The Settings area is displaying for all users. Wat to do? I want to hide it from all except the admin. And one more thing. My facebook status is not updating. I think u not checking ur site from April 10. what happened to you? I am waiting for ur reply. Sorry but I do not have too much time to maintain my free plugins. If/When I will be updating this plugin I will fix both problems. Hey man…love the plug in…last night I got a fatal error on line 174 PHP. Long story short, my web host got it resolved, but my facebook fans are no longer conneting via the plug in. Can you help? My fan id page hasn’t changed neither has my API Secret or Code…help. This is a great plugin. I have a problem with it though. I’m only using it for the feedburner and twitter counters. The feedburner counter displays correctly but the twitter counter shows zero subscribers and the thumbnail links me to the same page or post that is currently showing on the page. Does anybody had this same problem? got the same problem too! Hi, I found the problem with feedburner counters. We need to change the https protocol to http and that’s it! I hope this is helps! The twitter counter displays correctly but the feedburner counter shows zero subscribers and the thumbnail links me to the same page or post that is currently showing on the page. Does anybody had this same problem? I enter the facebook API key and secret key straight from Facebook and when I click “refresh counters now” I get this error. never mind, I found the problem. It was a bad facebook url. Thanks for the great plugin! I am having the same issue that the feedburner counter shows zero and it links to the same page. I manually changed those links, but I need the counter to be updated. can someone give me help? Hi, I have a problem with the settings on facebook .. When I click on the link you refer me says page not found ..
You can just give me the link please? I have the same problem any way to make it work? I have got this problem too with facebook fans, can you advise on how to resolve the problem? I uninstalled the plugin, but now, every time I even try to re-install the plugin fresh, then activate it, I get this error. Could someone help me figure this out, driving me crazy! asides from uninstalling the plugin – you have to go in the db to clear the entry from the wp_options table. otherwise, as soon as you activate the plugin – it will see that entry and will error again. to find it in the db – search for a string such as the facebook id. it should return 1 row. delete the value in that row then activate the plugin again. I am too having the same problem of facebook.. where is the admin.. will our problem be resolved??? Or can anyone suggest better plugin than this?? i got your Plugin running a few days ago and today I entered Facebook key and secret. After that i got an error message on …/subscribers-text-counter.php on line 174 Everytime I activate the plugin now the blog break down an isn’t available anymore. Do you have an idea how to solve that issue? Thanks for this great plugin, ive got it working on my website above wp sidebar. I would like to share that i tweaked my theme a little bit so i could include your plugin above my wordpress sidebar not wasting any sidebar space. If anyone is trying to acomplish this i published in one of my pages how i did. Kreci thanks again for the great plugin. Thanks for a nice guide! My facebook counter isn’t working either – I’ve removed from the widget for the moment but it doesn’t appear to be linking to my facebook page. I have added in the Page ID, API Key and API Secret. Doesn’t appear to update my counter. I have entered same details for my ‘add link to facebook’ plugin which has worked. Thanks it is a great plugin! I’ve installed the plugin and followed the instructions. I really like how easy it is to set it up in the widget area, however, it doesn’t display a number for Twitter at all. 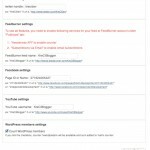 Do I need to install any additional plugin for the Twitter counts to be displayed? While the FeedBurner counter works just fine, the Twitter counter rarely, if ever, shows a number. Do you know how I should troubleshoot this? Thank you. Hi Chris, thanks a lot for this usefull WP plugin. Do you plan to upgrade it with the Google Plus social network ? I am really out of time and it is hard to maintain my free projects now. But will consider it in future. Thanks for suggestion! Thanks Sam! That worked for me! Installed your plugin and loved it, the problem came when I installed the facebook comments for wordpress -plugin. Now I cant access the site or the admin panel. All I recive is “Fatal error: Cannot redeclare class Facebook in /storage/content/09/141709/tidenmagasin.se/public_html/wp-content/plugins/subscribers-text-counter/facebook.php on line 37″. I tried to delete it and reinstall it, but the same error occurs when i activate it. I really don’t want to have to choose between your plugin and facebook comments. I would really like this pluggin to work, can anyone figure this one out? Thanks for letting me know. I have not updated it for quite some time. Will nee to do it soon. I got this error and I can’t solve it. Can you help me? It appears randomly and stay for about half hour and disappears when I just log in my admin panel. It’s very strange. This plugin has not been updated for quite a while and can cause some errors. I am planning to make an update soon so please stay tuned. Finally this was the sucker plugin that messed up my 2 days of work. The designer got it up, but when I ported to my server on production, no errors, nothing. just a blank dead page. Really really pissed off. New update will be released in next few days. 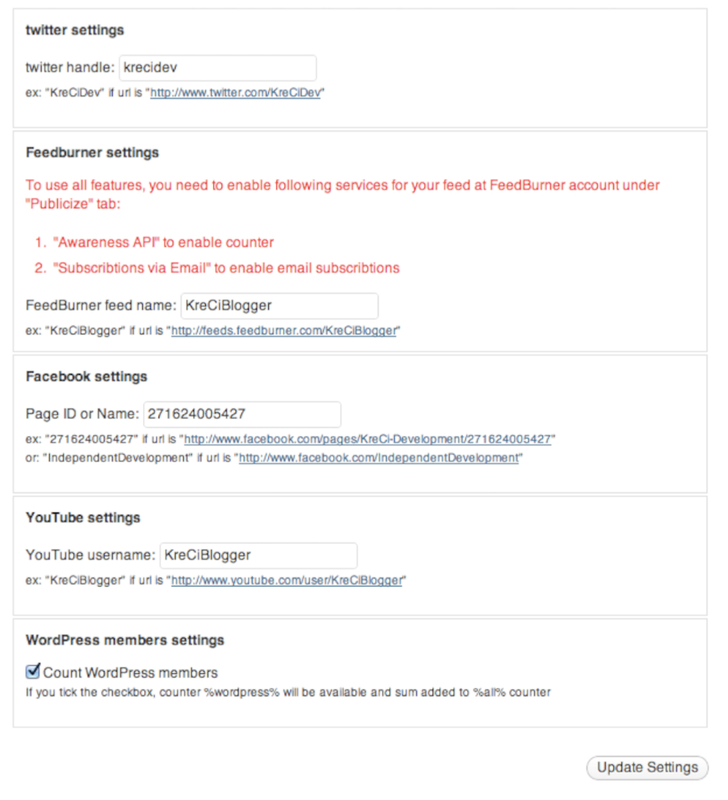 I’m trying to activate my feedburner and it’s asking by to turn on my “Awareness API” and “Subscribtions via Email” on my feedburner but I don’t have those tabs under my publicize menu. What do I do? Unfortunately FeedBurner has deactivated this function. I was wondering if it would be possible to edit the code for the next update a bit, so that it would be possible to display multiple youtube subscriber counts. I have multiple channels and at the moment I’m only able to display one channel’s subscriber count. It would be greatly appreciated if this could be included in the next update! The twitter followers has broken, is there any plans to fix this and release an update? Thanks. Excellent, thanks – working great now. Something has happened with Twitter and it no longer counts Twitter followers. :( Perhaps Twitter changed its api? Are there plans to update? Just released an update (1.7). Check settings page after upgrade. BTW. Tak. second thing – if I have no fans on facebook, should I have 0 as number of subs, or (like in my case) nothing… ? It saved 30k fans and treats 0 as an empty reply (error) so it still shows last correct value. I am not sure what is wrong with facebook counter. It would be best if you had at least one fan to test it. I just loaded 1.7 and my site is running WordPress 3.4.2. The Twitter followers still is not working. I logged off after install, closed Safari, opened a new browser, logged in and same results. The Refresh Counters Now button did not change anything either. The problem appeared when the Twitter Followers 0 count disappeared. There may have been a change to the Twitter site that is effecting this. Have you filled new form fields on the settings page? (Consumer Key & Secret). Thanks a lot KreCi ! Yes. I see my twitter handle, Consumer key (access token), and consumer secret. I clicked Update Settings and then even clicked Refresh Counters Now. Nothing changed. I then logged off my site closed Safari browser, opened a new Safari browser went to my website and still no Twitter Followers count. Please make sure you have latest WordPress version. Moreover please check if your key and secret are typed correctly, without any extra characters (spaces etc). The Consumer key and Consumer secret were copied from Twitter today and pasted into the Setting fields. Verified as correct. No change. I deleted my Twitter application recreated the Consumer Key and also the Consumer secret. 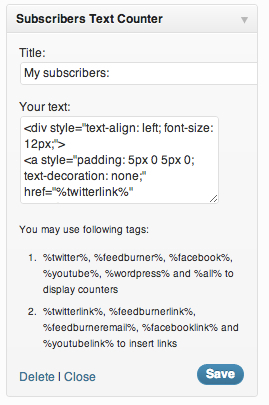 I put both in the Twitter settings of the Subscribers Text Counter 1.7 plugin. Clicked Update Settings and then clicked Refresh Counters Now. No Change still not seeing my Twitter Counts. As you requested I upgraded WP to 3.5.2. I still cannot display the Twitter followers. Its not the version of WordPress. There is something else that is a conflict that has developed since your last couple of updates. Please advise on solution. I have looked over my widget code and it is correct. I am still using WP 3.5.2. My Twitter access token is validated, correct Consumer key and Consumer secret being used and no spaces. Still no Twitter followers being displayed. I have over 11K Twitter followers. First, great plugin!!! i like it a lot! But one question: I would like to add my soundcloud followers to the counter. it is possible? and if yes, how? this would be fantastic if possible!!!! Any idea why the widget shows in Chrome, but is invisible to users running FireFox?